It’s a Pocket Pot Holder or is That Pot Holder Pocket? It was a pot holder, now it's a pocket. Ugggggggggggghhhhhhhhhhhhhhhhhhhhhhhhh….I can’t stant it…it’s to darned sweet…is this in your Etsy? I think I might have to have one. How..cute..is..that??? Oh Suzy, I saw that and knew precisely what I need to look for in the closet to take a photo of to show you that I made years ago. Reminds me of this today. The colors are so lovely so vintage. Oh a day or so late but i hope you had a wonderful birthday full of presents, birhtday food and a glass or two of bubbles!! Don’t know who it was that told me it was your birthday….as my Mother would say..’you whistle I’ll point’…well yes my Mother can be a little strange… Birthday kiss noises Linda Lilly Cottage. A belated pocket full of wishes on your Birthday, Suzy. very very very very very VERY cute! love it! Happy birthday, too, a day late – hope it was a good one! A Very Belated Happy Birthday!! A little bird let me know that you were celebrating yesterday, so I hope you had the best time with lots of cake, ice-cream, and of course, presents!! I wanted to let you know I saw your apron in an Etsy treasury in the current (Oct/NOV) ME Home Companion Magazine. It is about 3(ish) pages into the magazine. Love it!! Hey, I saw your apron in the Etsy ad in ME…Congrats! Such a cute pocket! 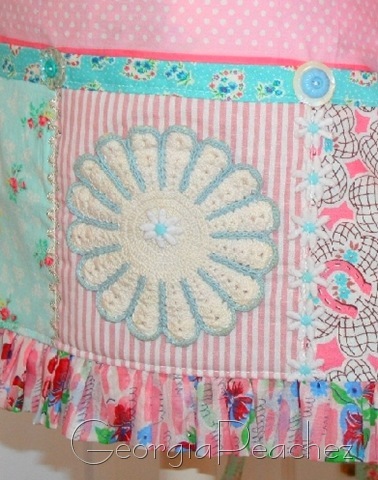 I loved seeing your apron in ME on the Etsy page!